Last week I hopped a plane and headed out to Long Beach, California for the winter TNNA trade show! This is a big convention where the exhibitors are yarn companies, needlecraft and accessory companies, and book publishers/distributors, all having to do with all things needle arts. 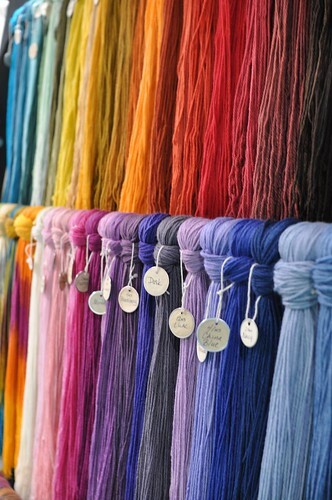 The consumers of the show are generally yarn shops, and then there’s designers like me! 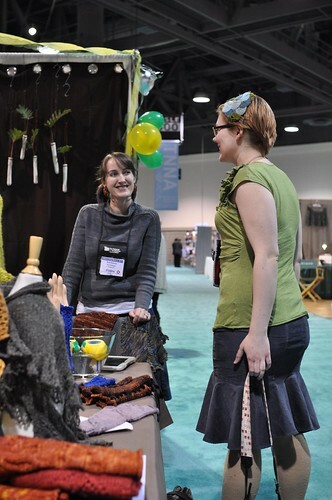 My wholesale distributor, Deep South Fibers had a booth, and I took along lots of samples to display there. 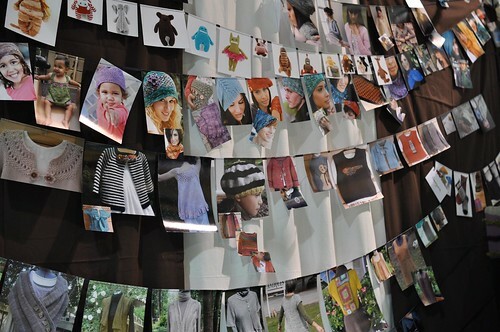 Deep South represents lots of other indie designers too, lots of whom were present at the show! There was lots of beautiful yarn to fondle, and people to talk to – I suffered from a bit of camnesia (forgetting to take photos) so I only have this one of the pretties in the Lorna’s Laces booth. 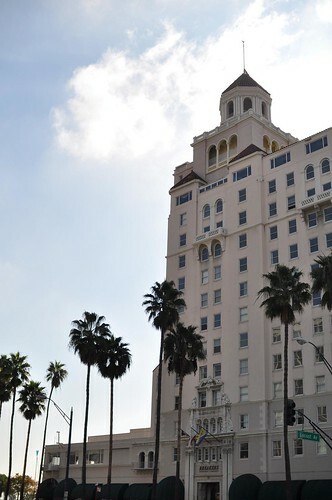 Although it wasn’t particularly warm – and the Californians thought it was freezing – it was pretty sunny, and I could get away with wearing just a light sweater and cowl. A light jacket might’ve been a good idea, but I just didn’t have one! For me, a very large portion of the fun of going to these trade shows is just seeing all my friends that are normally just on the internet, hanging out, eating good food and generally having fun. Going to these shows is work, too – after a long day of walking the horrible concrete convention center floors, your whole body just hurts – but the lunches and evenings more than make up for that! Ravelry Sarah and Miriam Felton wrapped up in my Ashworth scarf, at lunch at Islands – okay, I guess it was a little chilly to eat lunch outside, but we did it anyway. 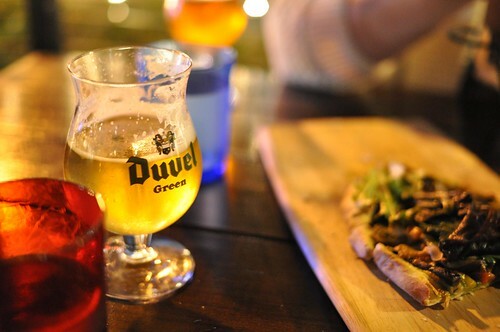 Duvel Green and flatbread at the Congregation Ale House – it’s new and highly recommended! I went twice over the weekend. They even serve a vegetarian sausage! I have lots of work to catch up on after the holiday break, and this trip has really inspired me to get crackin’! I’ve got a little accessories collection on the way, as well as a couple of sweaters – I’d better get back to work! OH, I really wish that I would live closer. Looks great. Oh, how marvelous! Definitely a little envy-inducing to think of such rich fiber/yarn/designer energy all in one place! Ooooo LOVE that picture from Lorna’s!!! I’m heading to a trade show next month. Can’t wait!!! Sounds like a great happening! Been to Long Beach and loved it! Ooo jealous I couldn’t go! Looks like you had a blast!